Hawkins is a well-established and respected firm of forensic scientists that investigates a wide range of losses including fires, explosions, accidents and engineering problems. Exhibits from the incidents that Hawkins investigates are held in a secure, fully fitted out warehouse. Formed in 1980 Hawkins provide a wide range of forensic investigation services nationwide and internationally from its UK and overseas offices. The company boasts a wealth of experienced consulting engineers and scientists. Hawkins stored exhibits from the incidents they investigated at their warehouse in Ely. However with more and more material coming in, a lack of space meant moving into a new warehouse which would be fully fitted out to meet current and future needs. Hawkins invited Acorn Warehouse Solutions (AWS) to tender for the project to deliver a fully fitted out warehouse which would make the best use of the available storage space. AWS’s proposal included comprehensive warehouse designs and solutions with costings. Hankins were impressed with the competitive proposal and good value for money offered and awarded the contract to AWS. AWS evaluated and surveyed the building and recommended a mix of Drive-In Racking for long term storage and Pallet Racking for easy access to large items, with timber decking and pallet collars for versatility. To make best use of the space available, AWS installed a mezzanine floor above the laboratories, which allowed for archive storage in the same building. AWS also recommended and specified fork lift trucks for the solution. With the warehouse solution designs approved, AWS started work in early 2013 to install the solution. The work was managed to fit in with Hawkins’ move programme, ensuring that the move was completed within the timeframe. As a result, Hawkins now has a fully fitted out warehouse with drive-in pallet racking, pallet collars and mezzanine flooring. The new warehouse means that Hawkins can now store more efficiently. They also have additional space to grow thanks to the mezzanine flooring solution installed by AWS. 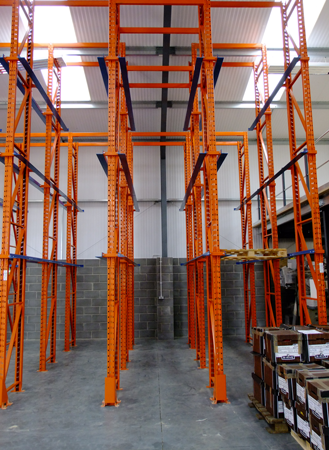 “Acorn came highly recommended and managed the warehouse fit out to keep the work to cost and on time. They worked closely with CMS to ensure the project was fully co-ordinated. We now have a fully functioning warehouse where everything works. It has given us much needed working space and it’s easy to move exhibits around as required. The mezzanine flooring has allowed us to maximise use of the space and we now have exhibits stored in number order so we can easily store and retrieve items as needed. Everyone at Acorn Warehouse Solutions was highly efficient, they were flexible and a pleasure to work with. We would highly recommend their services”.